Ice hockey as we know it today has existed in North America since the mid 19th century. Nowadays it is one of the most popular winter sports on the planet, enjoying strong support in Canada, the United States, Russia, Scandinavia and northern Europe. The globalisation of professional sport has also sparked interest in ice hockey beyond its Northern Hemisphere strongholds. The sport now holds a cult following in Australia, New Zealand, South Africa, east Asia and parts of South America, where nascent domestic and regional leagues continue to grow year on year. Like all major sports these days, ice hockey draws big money from punters worldwide. Leading online bookmakers run a huge spread of hockey betting markets for top professional and amateur competitions in North America and Europe, as well as for international tournaments and lesser-known provincial leagues. When betting on ice hockey, it pays to pick a safe, licensed bookie that ticks all the boxes for security, integrity and customer service. Each of the selected betting sites above is fully licensed to operate in your jurisdiction and offers Secure Socket Layer (SSL) encryption protection, trusted online payment options and first-class wagering products for all sporting and racing codes. Outright betting – Title odds for the Stanley Cup, Gagarin Cup and other major trophies are available year-round at most hockey betting sites. Punters can also place future bets on the NHL divisional and conference championships, as well as top individual honours such as the Calder Memorial Trophy (rookie of the year), James Norris Memorial Trophy (best defenceman), Vezina Trophy (best goalie) and Hart Memorial Trophy (league MVP). Head-to-head betting – Better known as moneyline bets in the US, head-to-head wagers are the most basic form of gameday sports betting. All you have to do is pick which team will win on the day. For example: if we back Anaheim to beat Pittsburgh, we will win at the odds listed if the Mighty Ducks salute. Note that head-to-head bets often only apply to regulation time, meaning they may not pay if an extra period is required to settle the result. Handicap betting – Also called puckline bets, these markets are designed to level out the odds when one side is heavily favoured to win. In doing so, a handicap bet may offer better value than a head-to-head market when backing the favourite. This levelling-out is managed by giving the underdog a head start, much like a handicap against the course’s par score in golf. If the betting line is 1.5 goals, for example, then the favourite must win by at least two goals. Period betting – Besides wagering on the overall result, punters can also place bets on certain things that might occur within any given hockey game. A popular choice is period wagering. As with quarters in basketball and halves in soccer, it is possible to wager on various markets that are settled entirely within any of a hockey game’s three periods. These may include the period result (which team wins the period) and the period score (number of goals in the period). Player prop bets – Much like the equivalent betting markets in basketball, football and soccer, ice hockey player props have enjoyed a boom in popularity among new-age gamblers. Internet bookies now run dozens of markets each game that shift the focus from the teams to the performance of individual players. Popular options include first goalscorer, total player goals, and player-versus-player props that pit stars on either team in a head-to-head contest. 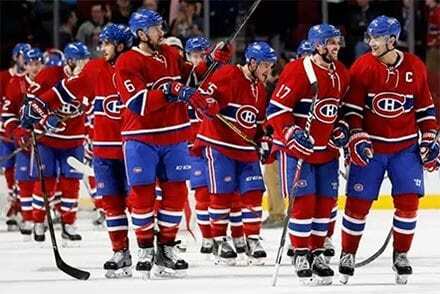 With 24 Stanley Cup wins, Montreal Canadiens are the most successful team in the National Hockey League. Founded in 1917 by four teams from Canada, the NHL is now one of North America’s greatest sporting leagues. Regarded as the highest level of domestic hockey in the world, it has expanded over time since the 1920s and now features 31 franchises split into four regional divisions. Top prize is the Stanley Cup, which was first contested in 1893 and is the continent’s oldest major sporting trophy. Feeder competitions such as the American Hockey League, the junior Western Hockey League and the collegiate NCAA Hockey Championship also attract plenty of attention from punters. The KHL is the modern-day incarnation of what used to be the Soviet Championship League (1946-1992) and later the Russian Superleague (1999-2008). It features 21 teams from the Russian Federation, as well as one each from China, Finland, Kazakhstan, Slovakia and the former Soviet states Belarus and Latvia. With several of Europe’s major ice hockey nations represented, it ranks second only to the NHL. The prestigious Gagarin Cup is awarded each year to the overall league champions, while the top-ranked Russian team takes home the Cup of Russia. Sweden’s national competition is widely regarded as the most evenly balanced top-flight hockey division in the world. It is also one of the best attended, regularly topping the rest of Europe for crowd numbers with average audiences in excess of 6000 per game. The SHL is comprised of 14 teams which, as with most European leagues, compete in a relegation and promotion system. After the regular season and play-in series, the top eight teams each season play off for the Le Mat Trophy. As one of the ‘Big Six’ nations in world hockey, the Czech Republic’s premier national division ranks among the best in Europe. It was founded in 1993 following the dissolution of Czechoslovakia and features 14 teams. The top six sides at the end of each regular season progress to the playoffs, while those ranked seventh to 10th fight over a wildcard entry to the quarter finals. The bottom four compete in a relegation and promotion battle with the top two from the second-tier Czech First League. Its population may be small, but Finland boasts a higher per-capita participation rate for ice hockey than any other nation in Europe. As of 2017, more than 1.34 per cent of Finnish residents are registered players – a figure second only on the world scale to Canada’s 1.76 per cent. The Liiga, also known as the Finnish Elite League, was created in 1975 and is now regarded as one of the continent’s very best competitions. It is also a founding member of the Champions Hockey League, where only the SHL boasts a higher intra-league coefficient ranking. While Switzerland may not be one of the sport’s Big Six nations, its premier national division is now among the strongest and best-loved ice hockey leagues in the world. Average match attendances in recent years have outstripped even the KHL, thus making National League A the most attended live hockey experience in Europe. Much of that is owed to the popularity of SC Bern, who draw bigger crowds than any other hockey club on the continent. The NLA also competes in the Champions Hockey League, where it earns four berths each year (only Liiga and SHL have more). The idea of a soccer-style continental cup competition had bounced around for decades before the European Trophy came about in 2006. That was merely an expansion and rebranding of the existing Nordic Cup preseason tournament, however, and lasted only seven years before folding in 2013 due to financial difficulties. That led to a complete overhaul of the concept, and in 2014-15 the CHL was born. Besides the founding leagues of Austria, Czech Republic, Finland, Germany, Sweden and Switzerland, it has also featured teams from Belarus, Denmark, France, Great Britain, Norway, Poland and Slovakia. Due to the sport’s relative infancy as a global pursuit, representative ice hockey does not carry quite the same status as international soccer, cricket and other codes played at a high level worldwide. Nevertheless, there are some huge rivalries among the Big Six nations – Canada, Czech Republic, Finland, Russia, Sweden, United States – and a pair of showpiece events where they take centre stage. With the exception of World War II and the Olympiads throughout the ’80s, the Ice Hockey World Championships have taken place every year since 1930. It is the highest level of international hockey and now features 48 teams across four divisions. The Soviet Union dominated the top-tier championship with 22 gold medals in 34 attempts, while Canada’s 26 is the most overall for a single nation. Since 1990, the Canadians (seven titles), the Czechs (six) and the Russians (five) have held sway. For years, Olympic ice hockey was the official world title tournament. While the IIHF World Championships may now hold that claim, there are many who still regard the Winter Olympics gold medal as the sport’s highest achievement. Germany, Great Britain and Switzerland are the only teams outside the Big Six to have mounted the podium in the men’s event. It was at Lake Placid in 1980 that the USA produced one of the greatest moments in Olympic history, stunning the Soviets with a squad of amateurs and college players en route to a shock gold medal in the ‘Miracle on Ice’.